InsurTech, RegTech and AI Solutions – A New Opportunity for Insurance and Technology! BHIB were proud to be a part of the 2018 BIBA Conference. BIBA is the UK’s leading Insurance Brokers association led by CEO Steve White, and represents insurance brokers, intermediaries and their customers. They work to direct and connect customers with insurance brokers, and help over 550,000 people per year when accessing insurance protection. 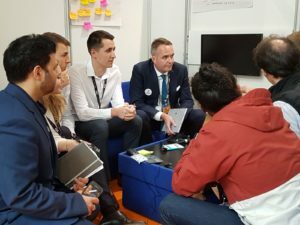 The Hackathon was a highly intensive 6-hour innovation challenge to come up with an Insurtech solution and develop a prototype of an app which could benefit Brokers – and specifically help their bottom line. The aim of the Hackathon was to help demystify InsurTech to many aspiring firms who wish to continuously evolve and stay relevant within the digital world. Individuals from various businesses across the insurance industry took pa rt in the hackathon to represent their organisations. These companies ranged from our group companies (BHIB, Brokerbility and Brokertech), as well as Brokerbility members Morrison Insurance Solutions and the Clear Group. We were joined by participants from Spixii, Konsileo, Aviva, and many more. All participants were split into 8 teams and were given 6 hours to come together to create a solution to a given problem. With only a short amount of time to come up with and bring to life these new ideas, the hackathon was certainly a high-pressured and an enthralling experience for all participants involved. The BHIB / Brokerbility employees involved were Ajay Mistry, David Rose, Kyle Tompkins and Joshua Austen as part of Team Spotlight, George Dudley in Team Clariclaim And Oliver Drummond in Team Claiminators. The teams were also provided access to experts in their chosen field who were able to help develop the team’s ideas. These experts came from a variety of backgrounds such as insurers, brokers, loss adjusters, InsurTech, web designers and data companies. All teams were required to construct pitches which were presented directly to a judging panel of 6 insurance industry leaders – Julie Page, Chief Executive Officer at Aon Risk Solutions UK; Steve White, Chief Executive at BIBA; Vivek Banga, Chief Digital Officer at Gallagher; Peter Blanc Chief Executive Officer at Aston Scott; Helene Stanway, Digital Leader at XL Catlin; David Summers, Chief Executive Officer at Simply Business – as well as being live streamed to hundreds of delegates. 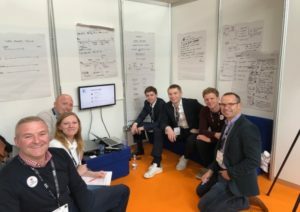 The judges made their decision on the overall winner using a range of judging criteria – originality, whole team involvement, value, elegance of solution, functionality and the pitch. All teams came up with excellent ideas which were very well received by all members of the judging panel. However, there can only be one winner and we are proud to announce that Team Spotlight were the winning team after pitching their application. The team consisted of members from BHIB, Brokerbility, Brokertech, Spixii and Konsileo. Team Spotlight were praised for their originality and relevancy in today’s market and developed an app focused on giving insurance health checks to SME businesses and focusing on how brokers can use joint data to solve common issues. Team Spotlight collected their prizes from Dame Martha Lane Fox on the Thursday morning in front of a crowd of BIBA attendees. Hackathon hosts for organising and delivering the event! Make sure to follow our social media pages to hear more about our experiences about the day. 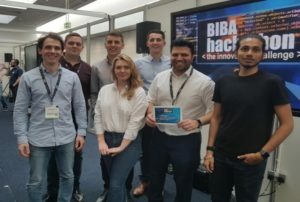 you can learn more about the hackathon event by visiting the BIBA website.